Santa Fe Lodge- Elegant Southwestern Style Home in the Mountains! Welcome to the Santa Fe Lodge - A southwestern home located in the mountains above Canon City, Colorado! 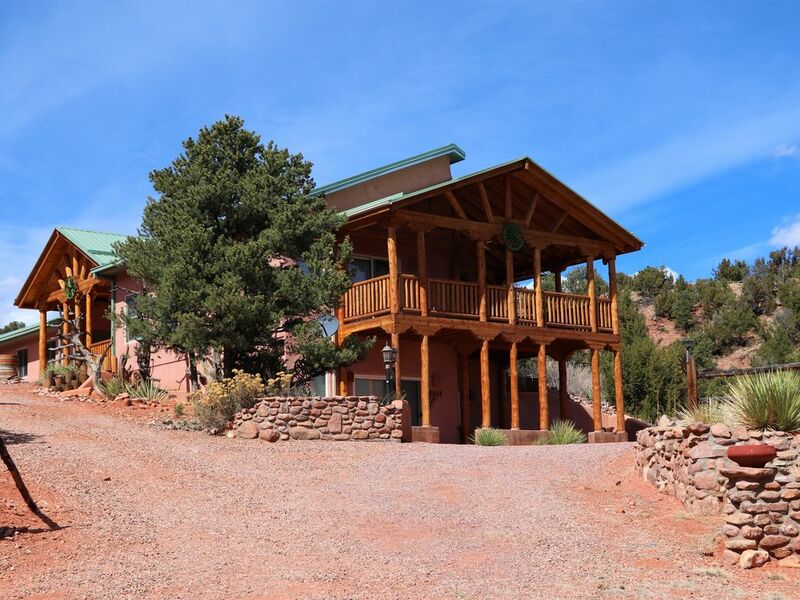 This home is located on 38 acres in a gated community just 12 miles (20-25 minutes) from Canon City, providing ultimate seclusion and convenience. Tall bluffs with red rock formations surround the home on 3 sides, sheltering the home and making it a fantastic year-round destination. The architecture, furnishings, and surrounding terrain beautifully embody the rich culture and history unique to the southwest. Guests will fall in love with the style and comfort of this home! Upon entering the home, guests will be greeted by an open floor plan with beautiful tile floors, exposed wood beams, and large windows that flood the home with sunshine. A beautiful rock fireplace graces the living room, while the kitchen boast custom cabinetry and an antique blue enamel cook stove. A large covered deck can be accessed from the living room and master suite. Off of the dining area, guests will find an additional patio with a propane grill. The master suite is located on the main level just off of the living room and has a king size bed as well as an adjoining 5 piece bath with a claw foot tub. The lower level of the home includes a large family room with board games, puzzles, and a television. This room also opens up to a beautiful patio. Two bedrooms are also located downstairs, one with a queen size bed. The third bedroom is a 'bunk room' with a set of bunk beds and two individual twin beds. Please be aware that this property does not receive cell reception. The home is equipped with wi-fi, and smart phones can be switched to wi-fi- calling for use. Canon City is home to world class white water rafting, The Royal Gorge, hiking, four-wheel/atv trails, dinosaur fossil museum and sites, helicopter tours, and gorgeous parks. The nearby town of Florence is overflowing with charming antique stores. The closest ski area is Monarch Mountain and is 90 miles away- perfect for a day trip! The Santa Fe Lodge is also only 16 miles from the historic mining town of Cripple Creek and 45 miles from Colorado Springs and all the attractions that the Pike's Peak area has to offer. The Canon City area is known as the banana belt of Colorado and has much warmer winter weather than the rest of the state. The highest zip-line in the country and some of America's best year-round rock climbing (near Shelf Road) can be found in this unique corner of Colorado. Wood burning fireplace. Guests to provide fire wood. Fully furnished kitchen with custom cabinetry, high end appliances, and generously stocked with everything you would need to prepare a wonderful meal on your vacation. This is a phenomenal home that sits on wonderful property. It is located close enough to Canon City to be fairly convenient and yet far enough to enjoy the remoteness. It is an extremely comfortable home that had plenty of room to sleep my family of eight and host a surprise 90th birthday party for my father-in-law. All of the rooms are spacious and beautifully appointed. We had a truly remarkable time! I highly recommend it! This was the perfect place for our very large family to spend Christmas. Everything we needed was available in the kitchen, bathrooms, bedrooms and living areas. We had room to spread out and room to hangout together. We hope to rent this lovely home again someday. Beauty full house and very big, it was clean a great place to go for vacation me and my family enjoy it a lot and Mike and Maggie very helpful and response right away. While the home is generally nice, we cannot recommend it to others, due to our bad experience with the internet. We were unable to connect to the internet our first night because the owner had changed the password and hadn't told either us or the management company. Since there is no cell coverage at the home we had to drive into town in order to reach the management company, but they didn't know about the change and had to try to contact the owner. When they finally got the answer they sent us a text message. Why they would send a text to someone who they knew didn't have cell or internet access is beyond us (they could have called us on the satellite phone at the house instead). We were trying to finalize our plans for the next day, and trying to make reservations on the Royal Gorge train, so this was a serious disruption to our vacation. Our advice is to stay someplace where the services provided in the house are actually as advertised. Oh my! We are so sorry for the inconvenience! For our future guests, please note this was very much an exception and the internet is very reliable, at this house. And the timing was also unfortunate, as the owner had just left the property was in the process of updating us with the update password. The property is just 20-25 minutes from town. Again we apologize for the inconvenience these folks experienced. Great place to stay with awesome views! We had a great time and a great stay at the Santa Fe Lodge! Plenty of room for 8 people. The porches were great to sit and relax with great views of the mountains. Very quiet and peaceful. We hiked around the land which has many red rock structures if that's your thing. Be careful of the cactus! Excellent stay! Would recommend to everyone. Truly a place to escape.